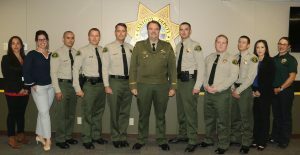 The Santa Barbara County Sheriff’s Office is pleased to welcome ten new employees to our team. On July 30, 2018, at a ceremony held at the Sheriff’s Training Bureau classroom, we officially welcomed two Administrative Office Professionals, a Dispatcher, four Custody Deputies, two Sheriff’s Deputies and our first ever-Behavioral Sciences Manager, Dr. Cherylynn Lee. Dr. Lee began volunteering at the Sheriff’s Office in 2015 as a Crisis Intervention Training (CIT) teacher. She was hired in 2017 as extra help to develop our Behavioral Sciences Unit (BSU). The Unit was formed to oversee cases involving mental illness and to develop a CIT team. The goal is to build community partnerships to help adopt restorative justice principals and divert individuals from the criminal justice system into appropriate services. The BSU collaborates with other agencies to develop training programs and assist law enforcement and community members involved in these types of calls for service. The Sheriff’s Office also welcomed and provided certificates of appointment to our new dispatcher Lindsay Williams and our two Administrative Office Professionals, Monica Alonzo and Chloe Rodenberger. At the ceremony, the Sheriff also swore in four new custody deputies, Tyler Fielding, Ignacio Rosiles Jr., Zachary Salce and Edward Woods. We also welcomed back Sheriff’s Deputy Benjamin Sandu who returned to the Sheriff’s Office after working in Medford, Oregon for several years and is currently assigned to Goleta Valley patrol. We also hired retired CHP officer James Belanger who is now working extra-help as a bailiff. We want to take this opportunity to wish all of our new colleagues a great career ahead with the Sheriff’s Office.